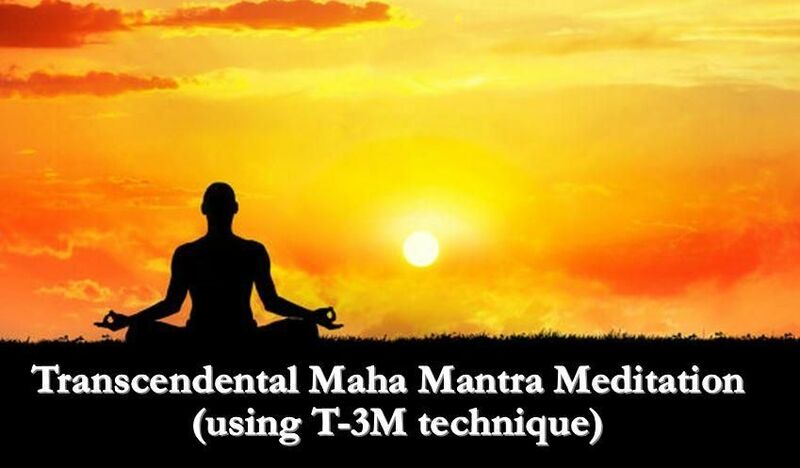 Transcendental maha mantra meditation: This sound vibration is not material, it is spiritual, and powerful beyond our conception. So it cannot be hindered in any way by something material; it surpasses all these material barriers. So you can know it that when you are chanting, you are also giving benefit to even the child in the womb. By offenseless chanting, when we associate with Krsna through His Holy Name, then all inauspicious things are cleared from the heart. So wherever you are you should always go on chanting, and that in itself will bring all perfection. Even when you are walking, you can softly chant Hare Krishna, Hare Krishna, or even when you are on the bus going to somewhere you can also chant. When you are working with your hands you can also chant and when you are resting or going to take rest you can also chant. Even in your toilet room while taking bath you can also chant. In this way there is no limitation or restriction for chanting this Holy Name of God, Krishna, and His Energy, Hara. In doing this business there is no loss, but there is very great gain which is transcendental realization. There is no such requirement that Japa should be silently and chanting should be be done differently. Loudly or silently, everything is all right. There is no such restriction. Only thing is that we should chant very attentively, hearing the vibration very distinctly. When to Meditate Anytime that works for you, particularly if it is the same time every day. Keep in mind that first thing in the morning, the amrit vela (2.5 hours before sunrise), is best because it sets you for the whole day and is naturally a quiet, reflective time (especially before sunrise). In the evening (at sunset or just before going to bed) is also a good time. Commit to a Meditation Whatever meditation you choose to do, to get the maximum benefit, fully commit to doing it for a certain amount and length of time. Keep in mind that 10 minutes a day is more effective than 30 minutes once a week. If you do miss a day, don’t beat yourself up, just cover it up the next day and keep up! Meditation Minutes there are specific lengths of time needed for certain desired effects in meditation: 3 minutes: Affects circulation (blood) and electromagnetic field. 11 minutes: Changes glandular system and nerves. 22 minutes: Balances and coordinates the three minds. 31 minutes: Affects all the cells and rhythms of the body and all layers of the mind’s projection. 62 minutes: Changes the gray matter of the brain. Integrates the subconscious “shadow mind” and the outer projection. 2 hours: Holds the new pattern in the subconscious mind by the surrounding universal mind. More than 2 hours : Transcend the material qualities like rajo guna, tamo guna and sattva guna and stays in shuddha sattva guna and actually enjoys the transcendental real pleasure incessantly. Master the meditation techniques: Learn the proper way of japa meditation from the transcendental guru, who is coming from the authorized disciplic succession. Choose a meditation that suits your goals and/or inspires you, and commit to practicing it over 40, 90, 120, or 1, 000 days. 40 days: Change a habit. 90 days: Confirm the habit. 120 days: You are the new habit. 1, 000 days: Mastery of the new habit.